Woohooooo....I'm gonna win Fantastical Food Fight this month!! I have a knockout salad that is perfect all Summer long. You will make it for every BBQ you host, every Potluck you attend, every Picnic that you pack. It is that good!! When Sarah, of Fantastical Sharing of Recipes and leader of this group, announced the theme, I immediately thought of a Main Dish Salad. In fact, I even made a main dish salad that I will be sharing with you another time. You wonder why I changed my mind? You won't once you taste this salad made with char grilled fresh sweet corn. Yes, I know it is not sweet corn season. But the guy from whom we get all of our sweet corn during the season told Frank that at the end of the year, he takes the ears of corn, cuts off the ends, places them in a freezer bag and throws them in the freezer. That's it, no par cooking, no peeling, no nothing. We tried it. It works!! All winter long we enjoyed fresh sweet corn, right from the freezer into the microwave. Nuke for 3 minutes, remove, husk and it tastes like you just picked it from the garden. You are very welcome!! Anyway, back to this salad. I found it in my latest issue of Cuisine at Home. I pulled out the frozen corn and husked it while still frozen. Coolest thing ever....all the silk peels right off with the husk. Then I grilled it....well, actually, I had Frank grill it while I cut up the other veggies and made the vinaigrette. We served this up with my Mexican Hamburgers one night and then again as a side dish with Instant Pot Carnitas. I still have some corn in my freezer and soon it will be corn season....I can't wait!! 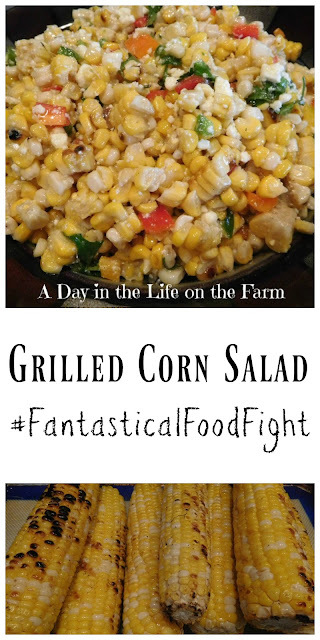 You will find links to the other Salads from the Fantastical Fighters right below my (winning) recipe! Beautiful chargrilled sweet corn tossed with peppers and cojita cheese and dressed with a lime vinaigrette. Perfect all summer long. Light a grill to medium high heat. Place 1 Tablespoon oil into a small bowl, whisk in salt and pepper to taste. Brush onto the ears of corn. Place oiled, seasoned corn onto the grill and cook, covered, until charred slightly on all sides, about 15 minutes. Cool slightly, remove kernels from ears and place in a large bowl. Whisk together the remaining 1/3 c. olive oil, lime zest and juice, cumin, garlic and honey. Taste and season with salt and pepper, as needed. Add the peppers, cheese and cilantro to the corn. Pour the dressing over all and toss to combine and coat. I like lightly dressed salads, increase dressing if desired. This salad can be served immediately or refrigerated for later, bring to room temperature before serving. Yum! I love corn on the cob and the other ingredients, but have never tried Cojita cheese. Thanks Vicki, you can substitute Feta if you can't find the Cojita. WHAT?! You mean I could have had delicious summer corn all winter? I need to hoard some this year. After I make this salad of course. It works great Nichole, enjoy!! Thanks so much for the great tips of freezing corn! Who knew? Your salad sounds absolutely wonderful. I've got some cotija just looking for a recipe. I think you will love this salad Karen. Great tips on keeping your corn over winter and what a lovely side dish! Grilled corn is by far my favorite thing to grill and my favorite way to eat corn. It just can't be beat!